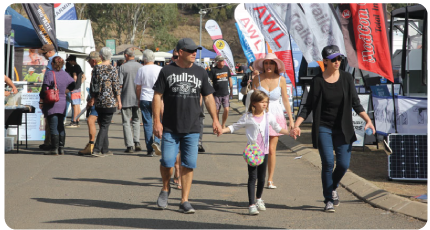 The Caravan, Camping and Boating Expo is a major focus at the Sunshine Coast Expo, with a massive range of retailers, manufacturers, designers and builders of leisure vehicles on site. A large range of the latest camper trailers, caravans, motorhomes and RV’s will be on display from local and regional companies. There will also be plenty of camping equipment and accessories, boats, fishing accessories and outdoor adventure gear galore! Statistic data received from the 2018 exhibitors and visitors who subscribed to the event newsletter. Australian Events produced 24,000 full-colour event guides which were were inserted into the Sunshine Coast Daily prior to the event and handed to visitors at the entrance to the event.